This is the last of the Tiny Flowers posts. Check the recent posts at the right for links to the earlier ones. The term ‘flowers’ is actually not correct this time. What I found in hunting for 1/4″ flowers was a berry of that size. It deserved to be in the spotlight with its translucent orange skin. Tatarian Honeysuckle (Lonicera tatarica) is a shrub found in most of Canada and the U.S. except for the south eastern states. It is not native according to the USDA. The plant is native to eastern Asia and was first introduced into North America as an ornamental in 1752. It is classified as noxious and invasive in several regions. My two photos were taken from about 2″ away using the super-macro setting with no flash. This entry was posted in Backyard, Nature and tagged Beauty, Berries, Flowers, Hiking, Iowa, Outdoors, Photography, Plant, Shrub, Wildflowers on June 27, 2014 by Jim R.
In front of our house we have some shrubs. One type is spirea. Some species of spirea have pure white flowers. The one in front of our house has pink flowers. It is known as Japanese Meadowsweet (Spiraea japonica). The U.S. Dept. of Agriculture shows it distributed in the eastern third of the country and part of Canada. It is not native here. It is native to Japan, China, and Korea. Many nurseries offer it as a yard shrub. We like the bunches of pink it presents in the late spring and early summer. Closer inspection shows a mass of individual small 1/4″ flowers. This picture reminds me that it is getting to be time to trim the shrubs before they get too big. This entry was posted in Backyard, Nature and tagged Beauty, Flowers, Hiking, Iowa, Outdoors, Photography, Plant, Wildflowers on June 24, 2014 by Jim R.
This tiny 1/4″ flower reminds me of an iris. It is actually from an ivy plant called Creeping Charlie (Glechoma hederacea). It goes by many names: ground-ivy, gill-over-the-ground, alehoof, tunhoof, catsfoot, field balm, and run-away-robin to name a few. According to the U.S. Dept. of Agriculture, it is not native to North America. But, it is widespread. It is actually native to Europe and SE Asia. 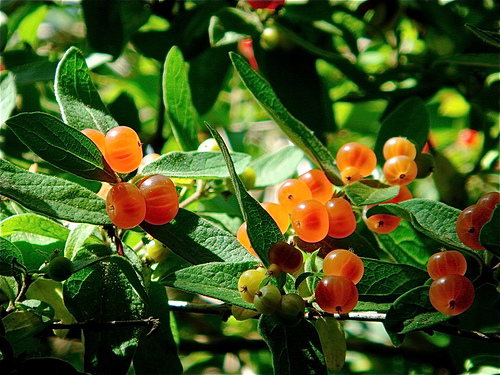 It has medicinal uses, is edible, and was used to make beer in Saxony before hops were introduced. Try it yourself to make a brew of Creeper 2013. It can be part of cheese making substituted for rennet. 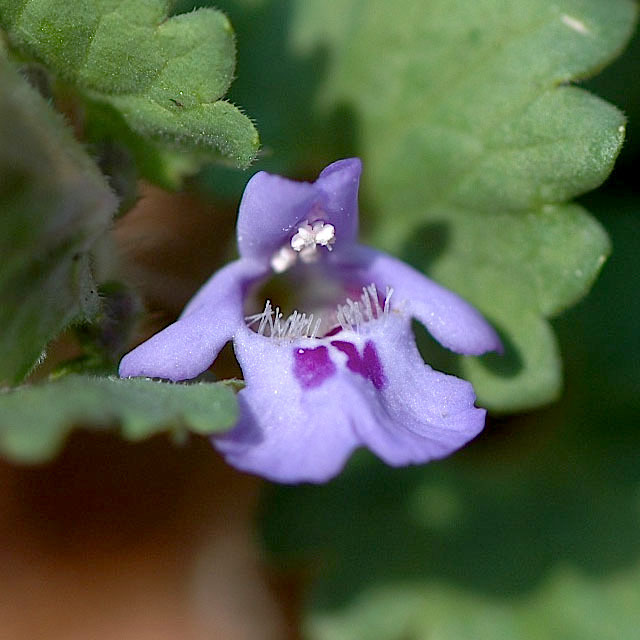 It is an attractive ground ivy with gently scalloped leaves. It is part of the mint family (Lamiaceae). It doesn’t climb up. Instead, it propagates horizontally along the ground. This vine in the center is about 6″ long and is near the edge of my lawn. Unfortunately, it is quite invasive and can take over spaces from other plants. Here it tries to make headway into my lawn grass. It weaves its way several feet in through the grass setting down rhizomes every few inches. It can be pulled out. But, it is tedious to remove. This entry was posted in Backyard, Nature and tagged Beauty, Flowers, Hiking, Iowa, Outdoors, Photography, Plant, Wildflowers on June 21, 2014 by Jim R.
The previous two posts featured yellow flowers. Here is one more. It is another member of the bean, legume, pea family (Fabaceae). Bird’s-Foot Trefoil (Lotus corniculatus) is found throughout Canada and the U.S. except for Nevada, Louisiana, Mississippi, Florida, and S. Carolina. It is also found throughout Britain, mainland Europe, Asia, north and east Africa, and in mountainous parts of the tropics. According to the United States Dept. of Agriculture site, it is not native here. They have clusters of flowers on low growing plants. Each individual flower is quite small. Remember, I was hunting for 1/4″ or less. Note the visiting fly on my finger for a sense of scale. According to the Wildscreen ARKive site, this plant can go by as many as 70 other names such as: bacon and eggs, butter and eggs, Devil’s fingers, Dutchman’s clogs, granny’s toenails, hen and chickens, lady’s fingers, lady’s slipper. The name can be derived from the leaves in this image from the Illinois Wildflowers site, our next door neighbor. Note the three leaves and their birdfoot shape. This entry was posted in Backyard, Nature and tagged Beauty, Flowers, Hiking, Iowa, Outdoors, Photography, Plant, Wildflowers on June 19, 2014 by Jim R.
This post continues the results of my quest for very small flowers noticed on my recent walk. This one is known as Low Hop Field Clover Trifolium campestre Schreb. According to Plant Profile of the USDA, it is found in most of Canada and the U.S. I notice the small yellow flowers every time we go walking. Each small 1/4″ clover blossom shows proudly among the green leaves. 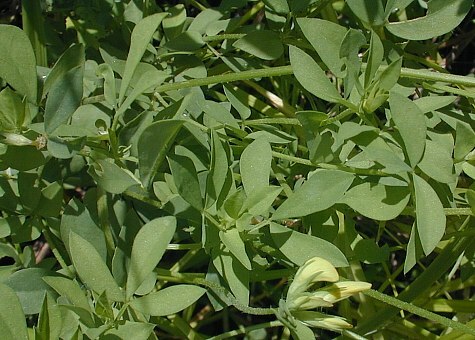 The plant is a member of the pea family (Fabaceae). A key identifying feature is the larger middle leaf of the three. If you want to read more details about this species, visit the Illinois Wildflowers site. This entry was posted in Backyard, Nature and tagged Beauty, Flowers, Hiking, Iowa, Outdoors, Photography, Plant, Wildflowers on June 17, 2014 by Jim R.
Big showy flowers are wonderful to see. There are many fine examples in the yards and gardens in most neighborhoods. Today, as I set out on a walk along our community trails, I brought my camera. I decided to search for some of the smallest flowers I could find. I tried to restrict my hunt to 1/4″ flowers. The macro setting on the camera allows me to get within 2″. I found several good subjects. Today, I am sharing one. More will follow in the days to come. Let me introduce you to Oxalis stricta L. It is also known as common yellow woodsorrel. The flower in this image and the next looks very large. That is an illusion caused by the macro setting on the camera. It is quite small. In order to get a better sense of scale, I supported the flower in my hand for comparison. It is a very small flower. The plant which produces this tiny flower has shamrock shaped leaves. This specimen stood about 12″ tall. I have seen smaller ones growing in my yard and garden. The common yellow woodsorrel is found throughout most of Canada and the U.S. except for some far western states. The United States Department of Agriculture offers more details here. This entry was posted in Backyard, Nature and tagged Beauty, Flowers, Hiking, Iowa, Outdoors, Photography, Plant, Wildflowers on June 16, 2014 by Jim R.
We decided to take a different path for our walk. Normally, we just go out the front or back door and take one of seven or eight possible routes for our walk. This time, we drove two miles for new scenery. This was one of the last times to see the colors and leaves this beautiful. Rain is forecast and will bring down the leaves faster. This new location proved to be a gorgeous setting with tall stately trees and brown, yellow, and orange colors. Near the end of our walk, we got very excited about some large animal tracks in the mud and sand. Feel free to add your own observations about what is going on in your backyard. This entry was posted in Nature, Outdoors and tagged Biology, Castor oil plant, Flora and Fauna, Hiking, Honey Locust, Photography, Plant, Rose hip, Tree on October 3, 2013 by Jim R.
Last month we posted the story of a joint project between our beautiful county park, F.W. Kent Park, and the University of Iowa. The park is in the process of restoring prairies to more of the landscape. On the northeast side of the park, a dense woods of planted conifer trees provided shade and shelter. They were not native, and as older trees, they were dying from age and disease. When we visited the park, expecting to see the old pines, we met with surprise. The entire pine woods was nowhere to be seen. The only traces remaining were some ground level cut stumps and small branch debris scattered about. The trees were removed by the university, giving the county conservation board a head start on the restoration project on that side of the park. The trees were chipped and will be used as biomass to supplement the coal in the university’s power plant boilers. For several years, they have been using biomass from some local sources in that effort. This video, also in the older post, explains. As reported by the Quad-City Times, the university has 3,000 tons of wood chips from the clearing to mix with coal. The supply should last through spring. While 3,000 tons sounds like a lot, the university needs approximately 100,000 tons of biomass to meet its 2020 sustainable energy goals. The university is experimenting with other forms of biomass, too. In June, it planted 16 acres of a perennial grass called miscanthus x giganteus. When the grass matures, a process expected to take three years, the university will try burning it for fuel, said Ben Anderson, UI’s power plant maintenance and engineering manager. The heat content from miscanthus is similar to oat hulls, he said. The university plans to plant another small plot of miscanthus in 2014, and then plant another 1,000 acres in 2015, Milster said. It also is seeking potential growers to contract with, he said. Miscanthus has ecological benefits, too: It improves soil quality and mitigates runoff, Milster said. The university does not intend to compete for land with corn and soybeans. Rather, it would grow the miscanthus on marginal land, [Ferman Milster] said. The university continues to evaluate proposals for biomass from individuals and companies. After using oat hulls successfully for several years, other possibilities include corn stover, tree waste from landfills, and furniture production waste. The university’s goal is to have 40 percent of energy use from renewable sources by 2020. Biomass replacement of coal is one of the most promising means to reach the goal. Solar and wind energy are important sources, as well. Since the university is a major presence in our community, we’re heartened to know they are aggressively pursuing sustainable energy goals. It’s good for the university, the greater community, and our environment. 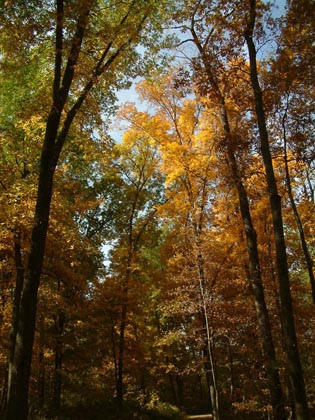 This entry was posted in Environment, Iowa, Nature and tagged Biology, Biomass, Conservation, Oak Savanna, Pine, Plant, Prairie, University of Iowa on September 15, 2013 by Melanie McNeil. For a couple of hours, sunshine streams in one of the living room windows directly on one of our plants. In response to the light, phototropism, the plant directs its leaves to maximize the amount of light it receives. The colors and subtle shades of yellow and green are really beautiful. Here, the sun backlights the leaf. The camera and tripod are brought closer and set to macro mode. The entire width is about 1″. Have an interesting day. Thank you for stopping by for a look. This entry was posted in Nature and tagged Auxin, Beauty, Home and Garden, Houseplant, Phototropism, Plant on September 1, 2013 by Jim R.
We go walking several days a week. There are several routes we take from our house covering about two miles each. A few times a year we go to a park owned by the county which is a few miles from home. 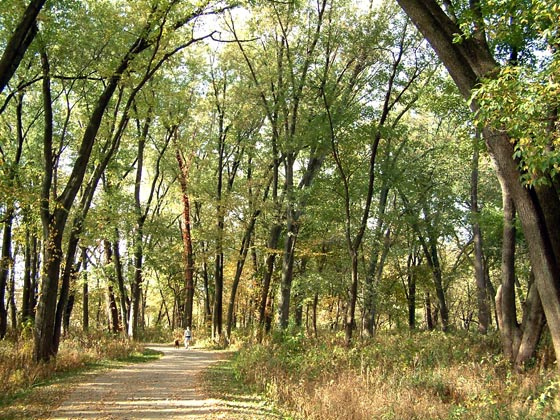 F. W. Kent Park is just over 1,000 acres with a lake, restored prairie, camping, education center, and hiking trails. The county board does a wonderful job of caring for the park. At this time of year, the restored prairies are in their glory with six and eight foot tall plants in full bloom. Recently, we headed for the park with a picnic lunch. After eating, we spoke with a naturalist in the education center and headed for the dense woods of pine trees in the northeast corner. We had been there last summer and really enjoyed the quiet, shade, and privacy they provided. Heading down the trail past the pond and the low marsh land near it, things looked very familiar. The trail turned and went uphill into a clearing as expected. To our surprise, the entire pine woods was nowhere to be seen. The only traces remaining were some ground level cut stumps and small branch debris scattered about. Come along for the rest of this story. This entry was posted in Environment, Nature and tagged Biology, Biomass, Conservation, Oak Savanna, Pine, Plant, Prairie, University of Iowa on August 25, 2013 by Jim R.